It’s crunch time! If you haven’t been exercising or keeping up your yoga and barre workouts then you’re late! They say Summer bodies are made in the Winter but if you are just now rubbing the sleep out of your eyes, I’ve got an awesome arm hack for you. My arms never saw definition until I started doing yoga on a regular basis. And mind you I was dancing at least 8 hours a week and picking up heavy trays at the restaurant. I love the way yoga incorporates one’s own body weight in such a dynamic way that it builds muscle strength, bone density and flexibility. So here are my best picks for really toning up the arms for your summer dresses and tank tops! Make sure your hands and feet start from plank pose. Then rock back into down dog. If your legs are tight and you find a lot of weight is in your arms then bend your knees so you can push your chest to the thighs. 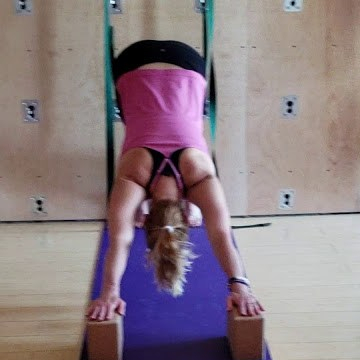 It’s important to externally rotate the arms in down dog so you can really engage the triceps. Often times students put their hand too far above their shoulder to gain any real strength. So start in plank pose with your shoulders directly over your hands then turn to one side and stack your feet on top of each other to form one long line. Use your inner thighs and core to keep your hips up and in line between your shoulders and feet. Oh the illustrious chaturanga! One of the most challenging arm positions in yoga. In this pose you want to keep your elbows in line with your wrists and do not round your upper back and dump your shoulders below your elbows! As you get stronger you can bring your knees up off the ground! Have fun and practice these for 3x at least 20 seconds each time. Then we’ll wave to each other with no flapping in the wind! Are you new to yoga and not sure where to start? 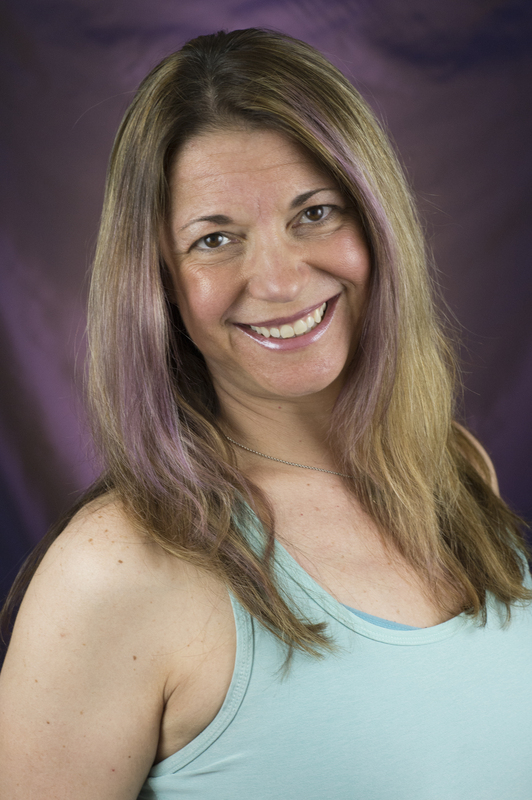 Or maybe you are a practicing and seasoned yogi looking for a community where you can expand your practice. Not matter what your circumstances, finding the right home to practice yoga can be overwhelming. There are classes at gyms, local community centers, and a ton of studios with 32 flavors of yoga: want a practice full of heads stands and arm balances? Done. How about dance music? Or even yoga ‘boot camp’? Sure thing! There’s a class for every yogi, even if most of those things aren’t necessarily yoga. But what’s important is that you find a studio with teachers that resonate with your needs; that provides you an inviting space to practice; that specializes in providing one-on-one attention to students in order to meet their needs; and that welcomes new yogis without making you feel like you don’t know what you’re supposed to be doing. This is what Fuller Yoga is all about. At Fuller Yoga, we are focused on the well-being yoga can deliver. We offer a range of classes to meet the evolving needs of our students, but we also specialize in helping all students achieve physical and mental well-being. We are staffed with a team of seasoned, highly trained instructors that specialize in proper alignment and working with students who suffer from chronic pain and injuries. We provide a clean, safe and judgement-free environment so students can learn the basics of a yoga practice, or take their existing practice to the next level, and experience all the benefits that doing yoga regularly can offer. We love what we do and take pride in being there for every student in our community, ensuring that individual needs are being met. So, if you’re wondering, or a friend asks you, here are 4 reasons why you should check out Fuller Yoga. 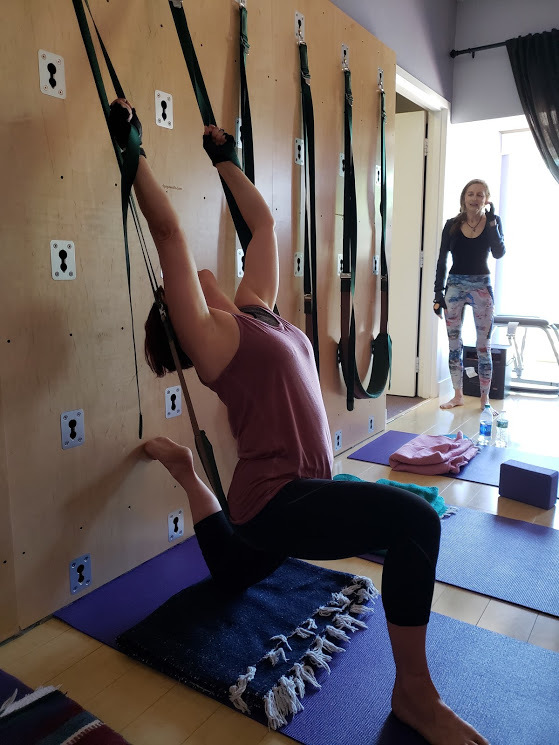 Our goal is to utilize yoga and Pilates to support student who are committed to learning proper alignment or suffer from chronic pain or injuries. Our team of experienced teachers focus on a practice that will support proper alignment, your individual body mechanics, and build strength and stability. We take pride in creating a clean and judgement-free learning environment where each student can focus on the mind-body connection to reducse stress, anxiety and pain. Check out our new student specials or contact us directly for a private one-on-one yoga session. How are your hips? Do you feel stiff in your hips and low back? Like they just don’t sway like they used to? If you sit in a desk most of the day or stand on your feet you might be tight in your hips and low back that can cause a lot of pain. Below you will find a simple stretch that can be done in stationary chair (no wheels please) that will alleviate aches and pains due to inactivity. So pull up a chair. Sit on the edge of the chair with your feet planted firmly in front of you and sit up tall. Now cross your left ankle over your right knee, like a man would typically cross his legs. If you are really tight your knee crossed over will point towards the ceiling and it will feel very awkward. In that case put books, blankets or a higher chair underneath you so your knee of the foot on the floor is 90º, in this case the right knee. Lift up through your spine to be as high on your sit bones as possible creating a flat back. You may feel some stretching in your hip just by being in this position and if so just hang out there for at least 30-60 sec. If you don’t get much sensation place your hands up a wall as high as you can, or find something to pull on like a yoga ropes wall or a bar and lean forward keeping the spine straight until you begin to feel a stretch in the hip of the leg that is crossed over. After 30-60 seconds change to the other side. Repeat each side at least three times. After you are done stand up and gently bend at the waist reaching forward towards your toes. Then come back to a standing position and take a walk. See if your hips have a little more swing to them. Now put an alarm clock at your desk or workstation to help remind you to do this again at least two more times throughout the day. You will find this stretch, when repeated often, will be very helpful in alleviating all sorts of hip and lower back pain. As always, let me know how it goes. I’m sure you’ve all heard about Bikram Yoga (yoga practiced in 108°), Hot Yoga, Sweat and Surrender Yoga and now even Hot Pilates and Barre classes so with all this hot yoga craze we may be missing out on the cooler side of stretching, breathing and relaxing. There are several styles of yoga that are great to balance out summer activities and warmer climates so you can still get all the benefits of yoga. The first one is restorative yoga. This therapeutic style of yoga is often called “Active Relaxation” which uses props to support the body while keeping it active with minimal movement in a relaxed, meditative state. These poses are used to trigger the parasympathetic nervous system, which is responsible for balancing the body. The postures are specifically designed for when you are feeling fatigued, weak, stressed from daily life or when you just want to experience stillness. They are equally beneficial to alleviate depression, reduce chronic pain, migraines and the symptoms of insomnia, asthma and to help recover from childbirth. The second style of yoga I recommend during the hot months is Gentle Yoga. Gentle Yoga consists of a balance between slow repetitive and sustained stretching. Standing postures are rare in gentle yoga and if they are performed they are to stretch rather than strengthen. Gentle yoga can be an excellent way to begin a yoga practice and start gaining flexibility in a way that won’t set you up for failure. The third practice is Yin Yoga. Yin (soft) yoga, as opposite of Yang (active, strong) offers a slow paced movement and helps press pause on hyperactive life we are living. Yin and Yang are opposites, yet together they create wholeness while complimenting each other. The yoga postures will be held for short periods of time (2-4 min) with intention to create more elasticity in connective tissue, access deeper muscles, release stress from the body and mind and aid in overall relaxation. With summer comes lots of activities and exuberant energy that needs to be balanced and grounded. It is just as important to take care of ourselves when we feel good as it is when we do not. These three yoga styles (Restorative, Gentle and Yin) are the perfect activity to do just that just look for these names of yoga at your closest yoga studio.